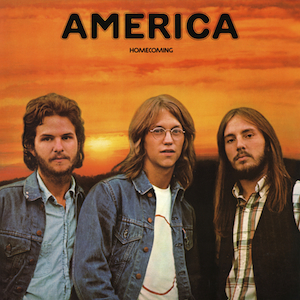 America‘s second studio album, Homecoming, showcases the trio hitting their folk-rock stride with a slight nod to some diversified musical sub-genres. Released in late 1972, this album features group added richer instrumentation, particularly with more pronounced guitar and keyboard layers to top off the acoustic guitar-based compositions. Lyrically and thematically, the songs build on America’s penchant for yearning and wanderlust. 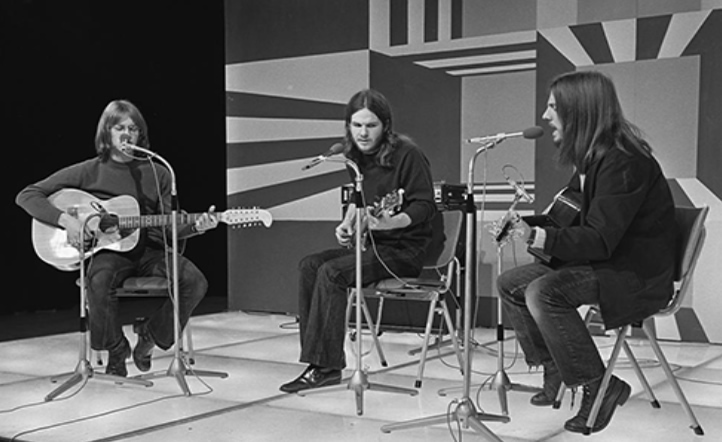 The group was formed in London by vocalists and composers Dewey Bunnell, Gerry Buckley and Dan Peek, who chose the name because they all had American fathers. They got some plum gigs opening for the likes of Pink Floyd, The Who and Elton John, which led to a brief contract with UK-based Kinney Records before they signed to Warner Bros. Their self-titled debut was released in 1971 and the lead single “Desert Song”, eventually re-titled “A Horse with No Name”, became a minor hit locally but a much larger hit worldwide. With this success, the trio relocated to Los Angeles and opted to self-produce the second album, Homecoming. The recording was delayed a bit due to an arm injury by Peek, but once it got rolling the trio enlisted Joe Osborn on bass and Hal Blaine on drums to round out the group arrangement for this album. The album commences with its most popular and indelible track, “Ventura Highway”. This is a unique classic with a fine, distinct and optimistic vibe and rhythm. It was written by Bunnell and features poetic lyrics inspired by a family trip through Southern California a decade earlier. Musically, Beckley and Peek provide the distinct harmonized guitars throughout, which helped elevate the song to a Top Ten hit in the US. 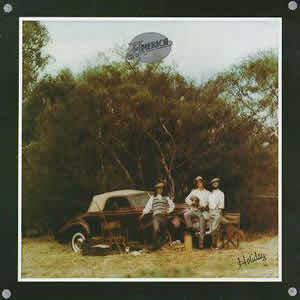 Beckley’s “To Each His Own” is a sweet, rotational piano ballad with some harmonized vocals in the chorus, while Peek’s Top 40 hit “Don’t Cross the River” has a very county/rock feel which seems to parallel the sound on the Eagles’ debut album, also released in 1972. The compositional roundabout returns to Bunnell with “Moon Song”, an asymmetrical tune which migrates from pure folk to an electric coda featuring a fine guitar lead by Peek. “Only In Your Heart” complete the original first side of the album as a choppy piano with smooth vocals by Beckley. “Till the Sun Comes Up Again” returns to the soft folk/rock for which America is best known as an acoustic tune with a slight arrangement in verses and harmonized vocals and good rhythms during choruses. “Cornwall Blank”	branches out towards a Southern / Allman Brothers Band feel with a darker feel with much reverb and layers of electric guitars while the album’s only cover song, “Head and Heart” written by John Martyn, includes a slightly funky electric piano. The aptly titled “California Revisited” acts as a late album counter-point to “Ventura Highway” featuring early seventies, moving soft folk sound with heavy harmonies. The album concludes with Peek’s “Saturn Nights”, features soft piano and deep harmonies, eventually warming up with fine rhythms and more direct melodies. Homecoming reached the Top 10 on the Pop Albums charts and helped propel America towards ever greater success throughout the decade of the 1970s.